GEORGIAN COLONIAL CUSTOM BUILT IN 2001 ON 99 ACRES WITH THE FINEST MATERIALS AVAILABLE. MAINTAINED IN LIKE NEW CONDITION. FIRST FLOOR MASTER SUITE WITH HUGE BATHROOM, HIS AND HERS CLOSETS, EXERCISE ROOM, ALL WOOD PANELED OFFICE/LIBRARY, GAME ROOM ABOVE 3 CAR GARAGE COULD BE SEPARATE GUEST APARTMENT, 16 X 40 FOOT POOL, TENNIS AND BASKETBALL COURT, 3 CAR GARAGE AND SEPERATE 2 CAR DETACHED GARAGE, 40 X 80 INSULATED METAL BARN WITH OFFICE, LARGE POND WITH GOOSE PIT AND DUCK SHACK, EXCELLENT WATERFOWL AND DEER HUNTING. 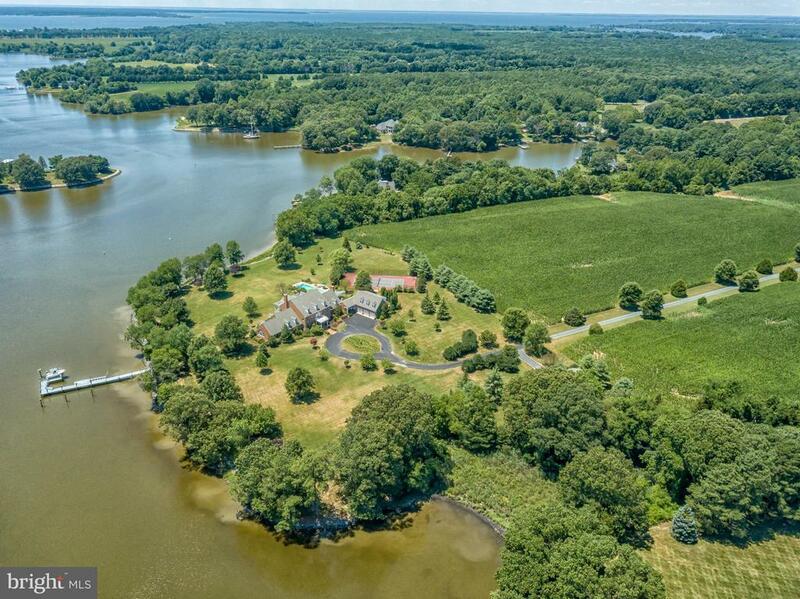 DEEP WATER PIER WITH 20K LB BOAT LIFT, ALL RIP RAPPED SHORE LINE, BEAUTIFUL WESTERN SUNSETS OVER LA TRAPPE CREEK Green Remarks: GEORGIAN COLONIAL CUSTOM BUILT IN 2001 ON 99 ACRES WITH THE FINEST MATERIALS AVAILABLE. MAINTAINED IN LIKE NEW CONDITION. FIRST FLOOR MASTER SUITE WITH HUGE BATHROOM, HIS AND HERS CLOSETS, EXERCISE ROOM, ALL WOOD PANELED OFFICE/LIBRARY, GAME ROOM ABOVE 3 CAR GARAGE COULD BE SEPARATE GUEST APARTMENT, 16 X 40 FOOT POOL, TENNIS AND BASKETBALL COURT, 3 CAR GARAGE AND SEPERATE 2 CAR DETACHED GARAGE, 40 X 80 INSULATED METAL BARN WITH OFFICE, LARGE POND WITH GOOSE PIT AND DUCK SHACK, EXCELLENT WATERFOWL AND DEER HUNTING. DEEP WATER PIER WITH 20K LB BOAT LIFT, ALL RIP RAPPED SHORE LINE, BEAUTIFUL WESTERN SUNSETS OVER LA TRAPPE CREEK. Directions: Rt 50 to Sanderstown Road, Straight to Island Creek Road to Southside Island Creek Road. South Point Farm on your left. Entrance between two brick columns.